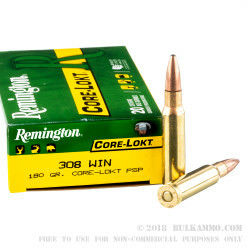 If you have not experienced Remington's "Deadliest Mushroom in the Woods," this .308 Win Core-Lokt ammo is about to become your new best friend. 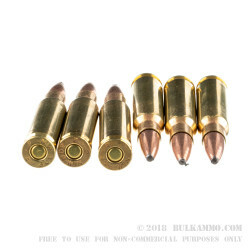 This powerful center-fire rifle cartridge has a muzzle velocity of 2620 fps and an impressive muzzle energy of 2743 ft/lbs. The strong energy transfer combined with the devastating expansion of the 180gr soft point (SP) projectile facilitates massive internal damage in medium-size game animals. Remington Core-Lokt technology binds the copper jacket to the soft lead core of the SP projectile. When it strikes soft tissue, the SP expands and folds into a wide blunt mushroom shape that will help you ground your trophy buck as humanely as possible. 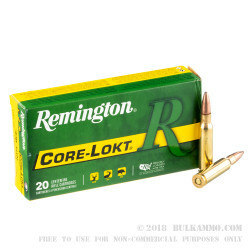 Remington Core-Lokt ammo is deadly, efficient, and economical. 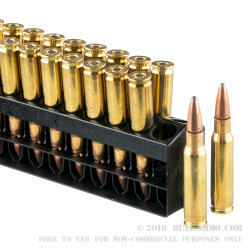 This .308 Win ammo is new-production, Boxer-primed, and reloadable. The casings are made of non-corrosive brass.